When it comes modernization and hardware concerns on the battlefield, it always comes back to issues of SWAP – Size, Weight and Power. Today, research, design and investment in military electronics is focused heavily on the miniaturization of equipment, sensors and weapons. System size and weight reduction of electronics allow for more functions crammed into smaller spaces. Cables and connectors, which play an often unsung, yet critical role in modern warfare, are no exception. Military connectors are found in all shapes and sizes, and despite an increasing trend towards wireless comms, lightweight yet rugged cables make everything from communications to ISR, to electronic warfare possible. All of this has added up to a push for highly rugged and reliable connectors and cables. Today’s “wired soldier” requires special tracking and information sharing like never before. Monitoring of ground troops activity and positioning in real time is essential for safe and effective operations. Connectors need to be secure and reliable, and yet simple to “quick release” on equipment and electronics when rapid replacement, or release without damage, is necessary. To meet these needs, interconnect specialists such as Omnetics have designed increasingly smaller quick-release cable and connector systems that in many ways are driving modernisation efforts worldwide. 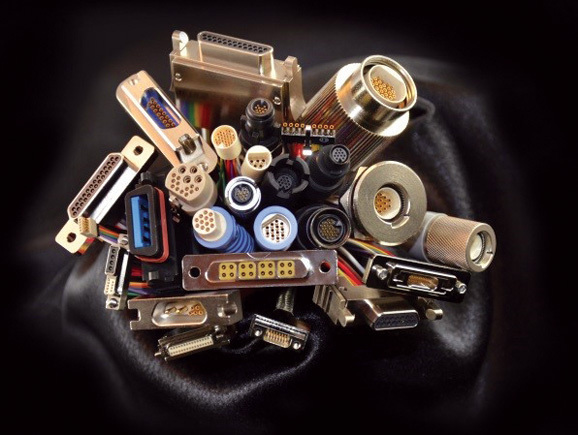 One good example of cable and connector suppliers can be a reflection of many. Omnetics Connector Corporation built its strength with a focus of high-reliability and miniaturization. Omnetics responded to the massive military/aerospace industry and cut through the rigors of specifications, and testing. In addition Omnetics followed design and manufacturing down into the nano-interconnection foot print. The company stakes its reputation on meeting or exceeding the quality control and manufacturing standards needed to continuously supply high-reliability component level performance and dependability. But, the company has gone beyond that point to become a leader in custom design, meeting new sizes and shapes demanded by the unprecedented miniaturization of digital electronics. Omnetics provides a family of simple, highly-reliable standardized, miniature circular connectors that can be fit into the molds to reduce size and cost of the equipment while retaining performance and reliability. This kind of solid model design interface also improves the speed and efficiency of the manufacturing process and shortens development cycles. These new miniaturized connectors match up perfectly with the evolution of military electronics and support equipment portability along with size and weight reduction, while also retaining the highest reliability standards that the military counts on. Miniature circular connectors, Micro-D connectors, the “Bi-lobe”, (Nano-D connectors) and the newest nano-sized circular connectors serve the application specific military market well. Always an innovator, these latest offerings from Omnetics help solve miniaturization challenges and beyond, by providing new methods for addressing data-acquisition, situational awareness, and even higher speed digital signal delivery through simple, ruggedized connectors and cable systems. These micro designs also assist within the equipment design by allowing circuits and interconnect systems to be smaller and attachable during the modular assembly process. It has been said that a chain is only as strong as its weakest link, in the field, the modern warrior may only be as strong as his best connector, and companies such as Omnetics are ensuring that is very strong indeed.